True or False? 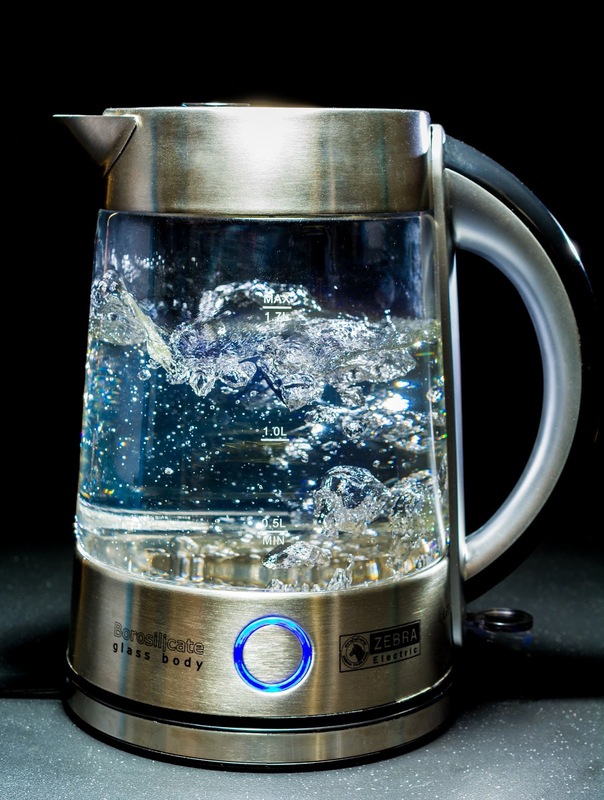 When water boils, the bubbles are air being released from the water. In an American Association for the Advancement of Science survey, 29% of middle school students selected "true" on a similar question. In a class of 30 students, that means about 9 of your students would not really understand phase changes well enough to know that the bubbles are water vapor, not "air". 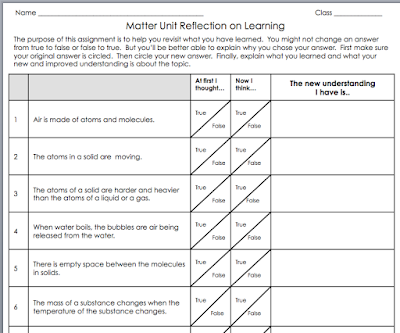 But they've "learned" about phases of matter every year since kindergarten haven't they? In theory, they have. But obviously, their misconceptions are stronger than accurate conceptions. Just for fun, I asked a few non-science teacher adults that same question. All of them said the bubbles were air being released from the water. ALL of them. A couple of them, on reflection, corrected themselves. Still, it made me really think about the persistence and pervasiveness of misconceptions. It made me realize that wrong answers can be more important to a good teacher than right answers. Wrong answers can actually make you a better teacher. A few years of teaching will definitely teach you a few common misconceptions. We probably all go out of our way to address those we know of when we are teaching. But here's the problem with that. You might know that some students hold a specific misconception. But you don't know WHICH students hold that misconception. Maybe none of them do. Maybe all of them do. Unless you pre-assess, you'll never know. 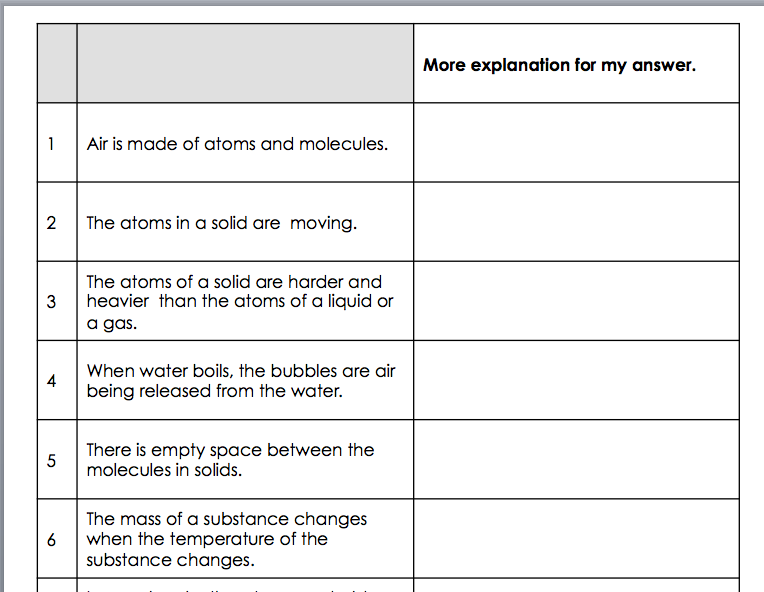 And, because you're a science teacher, you probably don't hold many of the common misconceptions yourself. That fact, paradoxically, handicaps you by making it difficult to write a pre-assessment. If you don't hold the common misconceptions yourself, how do you know what they are? 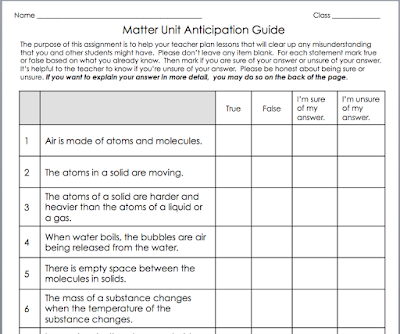 You can write a pre-assessment based on your own post-tests, or unit activities, but they will only assess whether students know what you know. They might not tell you what students believe instead of what you want them to know. Students don't come to you as empty vessels. 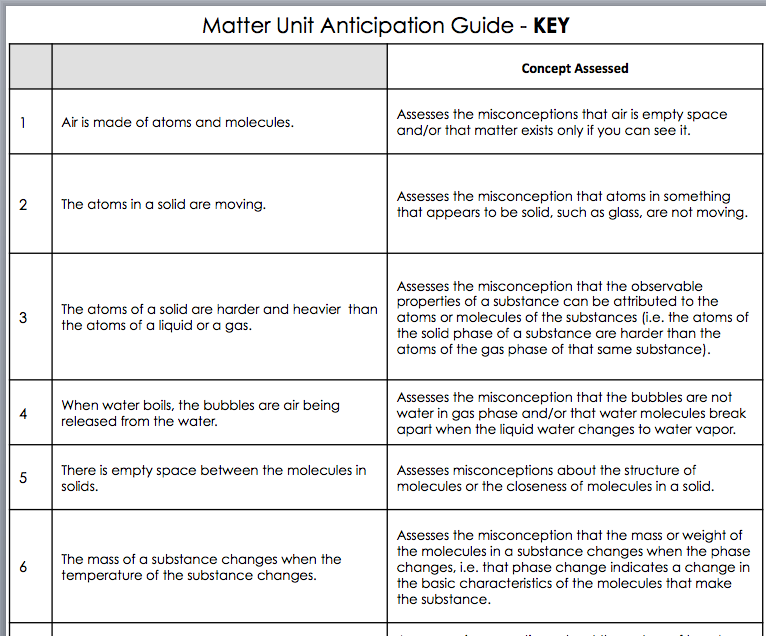 They already have conceptions about things like the phases of matter, some of which are misconceptions. 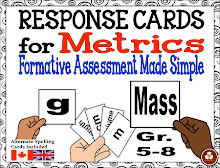 Pre-assessment shouldn't be just finding out that they have misconceptions. It should tell you what those misconceptions are. 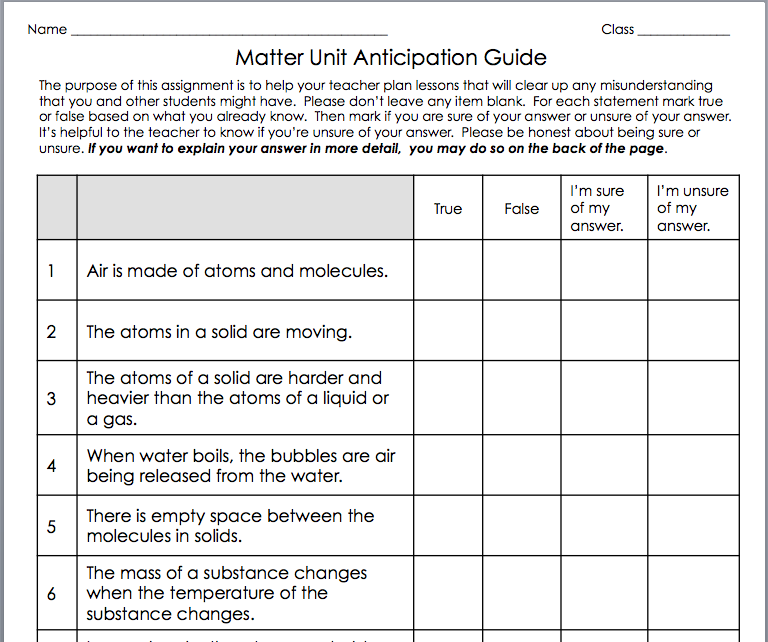 To make pre-assessment a little easier for teachers, I did research on common scientific misconceptions held by different age groups of students and created several pre-assessments that you can use. 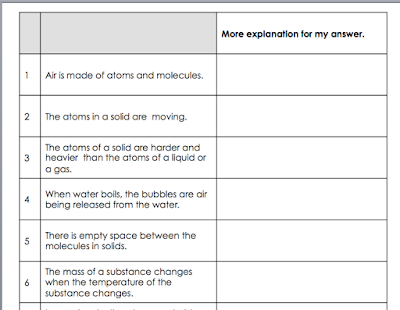 Students are also asked to self-identify how sure they are of their answer. 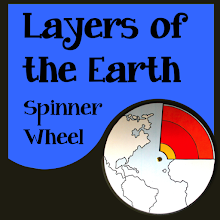 That gives you a chance to identify the students who hold a misconception most firmly. On the back side, they are given an opportunity to further explain their answer to you, or to clarify why they selected their answer. 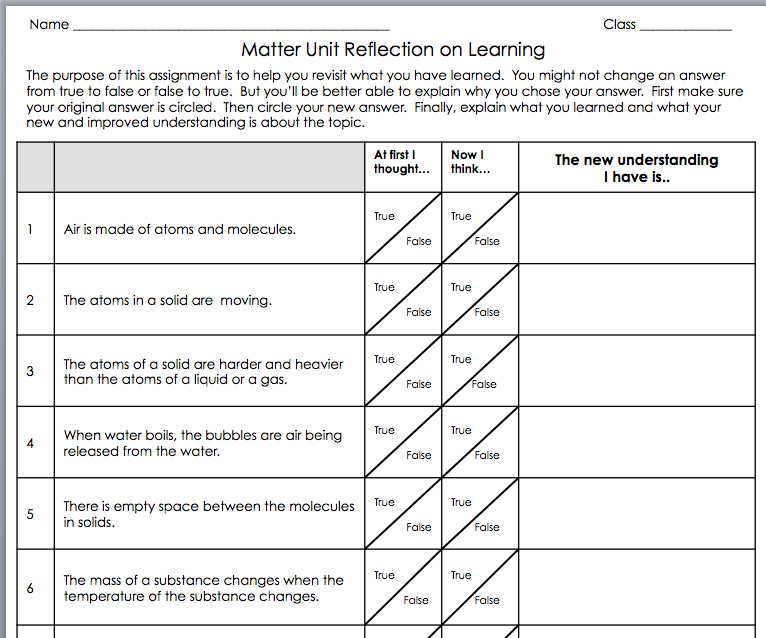 To help you identify students who still hold a misconception at the end of your unit, before the unit test, you can return the pre-assessment to your students and have them reflection on the changes in their understanding. That will help you to see if they get the "right" answer but for the "wrong" reason. 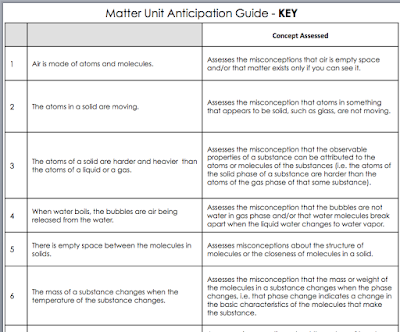 Then you can address lingering misconceptions before the unit exam. 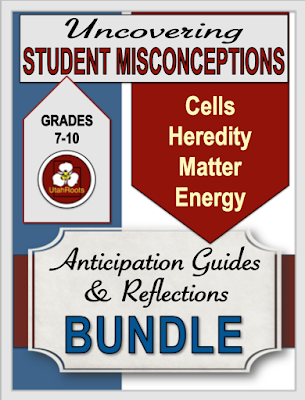 Check out my Bundle of Pre-Assessments for these units: Cells, Energy and Living Things, Matter, and Heredity.